The comic book crossover often sounds like a good idea doesn’t it? I mean who wouldn’t find the idea of seeing Green Lantern team up with Silver Surfer? Or Alien vs Predator?Superman vs Spider-man was the first offical Dc/Marvel crossover to get the ball rolling in the seventies. Fans just yearn for the type of meetings between characters that seem a good fit for each other. Often times the idea of it is better than the idea itself. You seldom come across a great crossover. Sure, there are good ones, like The Shadow vs Grendel or Batman & Judge Dredd, but then there are just weird ones. 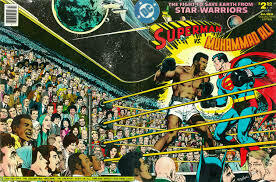 I think the beginning of the weird crossover started with Superman vs Muhammad Ali. This may seem weird to you if you’ve never heard of it before but it happened. The funny thing is how many more bizarre crossovers there are out there. I’m amazed some of these were even conceptualized, and even more amazed that they were greenlit. Here’s a brief list of just some I found to be totally out of left field. Suprisingly This comic gets a number of glowing reviews. 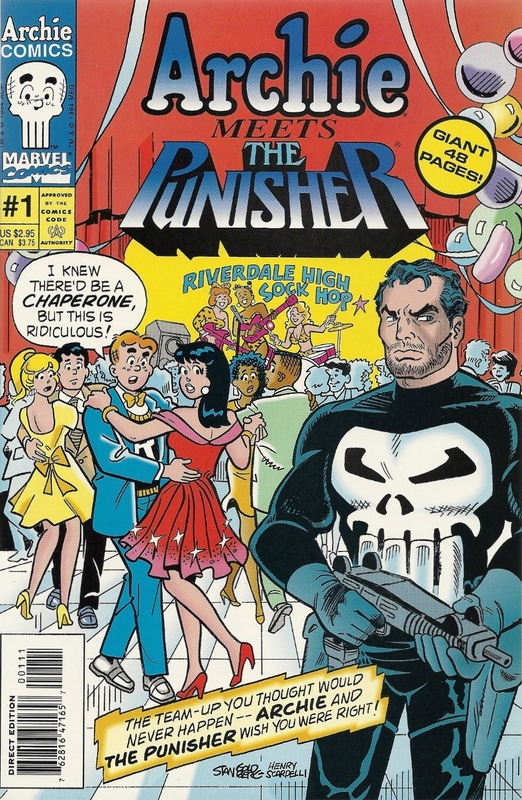 It’s basically Punisher looking for a drug dealer that looks exactly like Archie. The premise, while zany, actually works. It’s still very unusual to me. Who thought of pairing up Marvel’s most brutal vigilante with super-kid friendly Archie?! The very idea of Archie being gunned down in a hail of bullets is darkly humourous to me. John Buscema handled drawing the Punisher in this so at least you know you have good art. 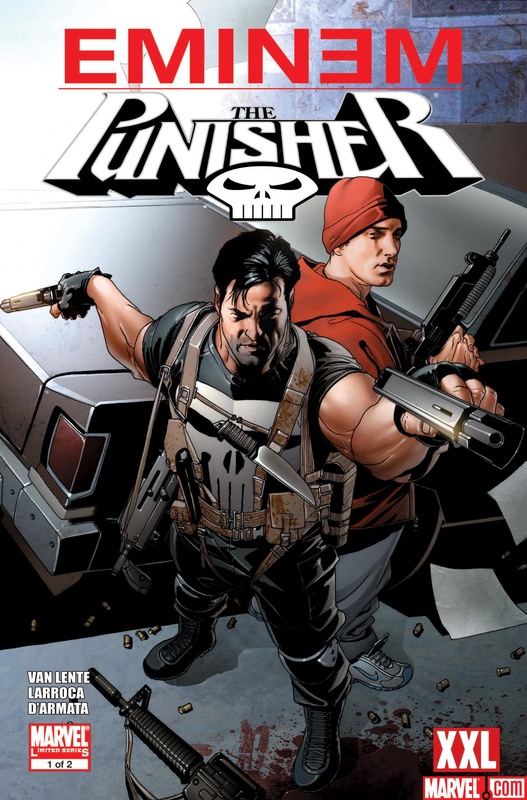 Again, I don’t know why Punisher is the go to guy for a weird crossover but here we are. I suppose, in this case it’s because Punisher has the most street cred? I remember seeing this advertised when it came out thinking, WTF. And it wasn’t even one issue. I guess the storyline was complex enough to require a 2 part mini-series, Right??? The art duties were handled by Salvador Larroca, who is currently drawing Marvel’s Darth Vader title. So at least it’s cool to look at. Army Of Darkness & Xena: Why Not? I suppose the idea of this happening isn’t THAT weird. I guess Ash could’ve just went to another time and ended up in Xena’s realm. Sure, but still… It’s pretty weird. 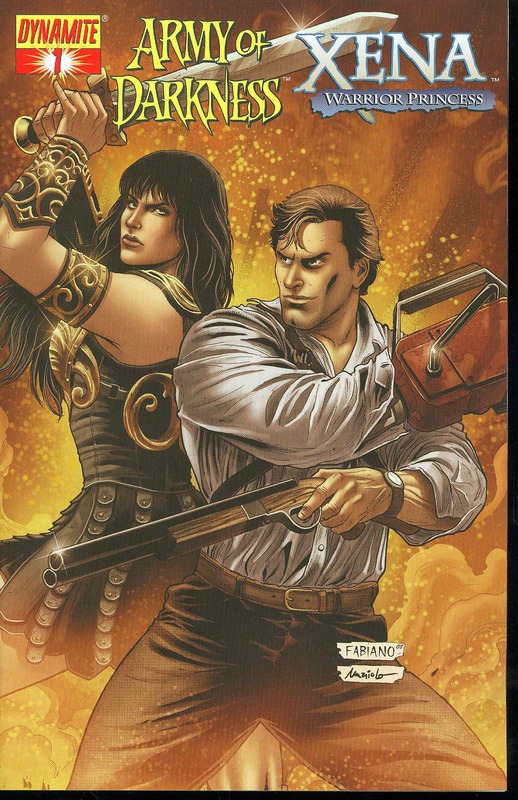 Full marks go for the actual title of this comicArmy of Darkness / Xena: Why Not? At least they’re honest about doing the crossover.Its by John Layman, who is a credible writer, so perhaps this is funny as hell?! 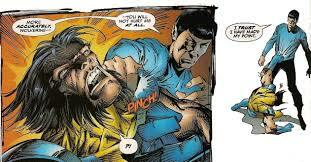 The one thing sure to bring Wolverine down!! I wonder what kind of effect a Phaser would have on him? Why not combine our fun loving Spidey with fun, yet disgusting Ren & Stimpy? Well, at least they gave him someone to duke it out with. No one other than Powered Toast Man could take him on anyway. 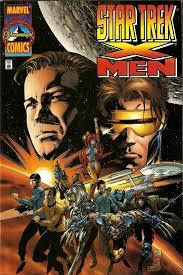 I actually remember owning this comic. It was in a pack of random comics I bought at a dollar store. It was as zany then as it is now. 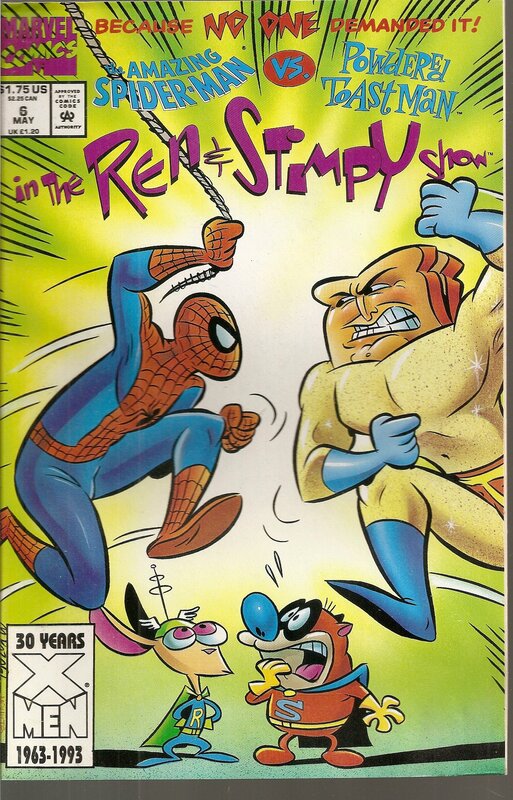 Maybe something like The Simpsons would’ve made more sense instead of Spidey, but Marvel did have the comic rights for Ren & Stimpy at the time so, there you go. Now we get to Superman. 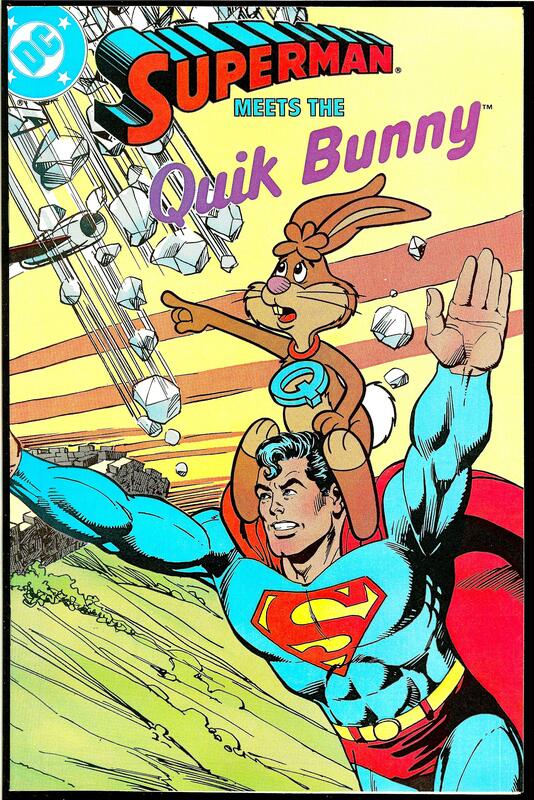 I think he’s the undisputed king of the, weird comic book crossover, of which you will soon find out.This one was a pretty blatant attempt to sell more Nestle Quik. I remember I bought the pack of Quik and received this comic to go with it. Any comic featuring Superman was worth my time as a kid. Even this one. Not that I particulairly loved it though. This fabulous tale was poetically titled: Quik Thinking. Clever huh? 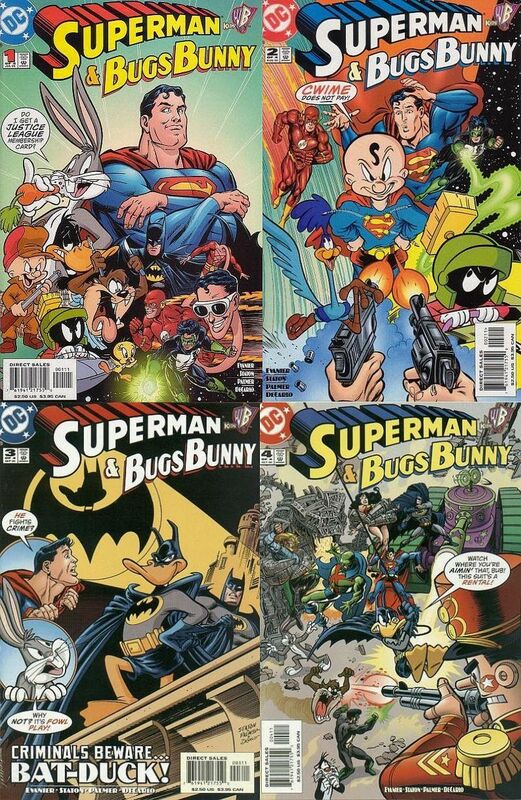 To be fair, it seems more like it’s the JLA and Looney Toons rather than just Superman & Bugs Bunny. Just look at these covers! 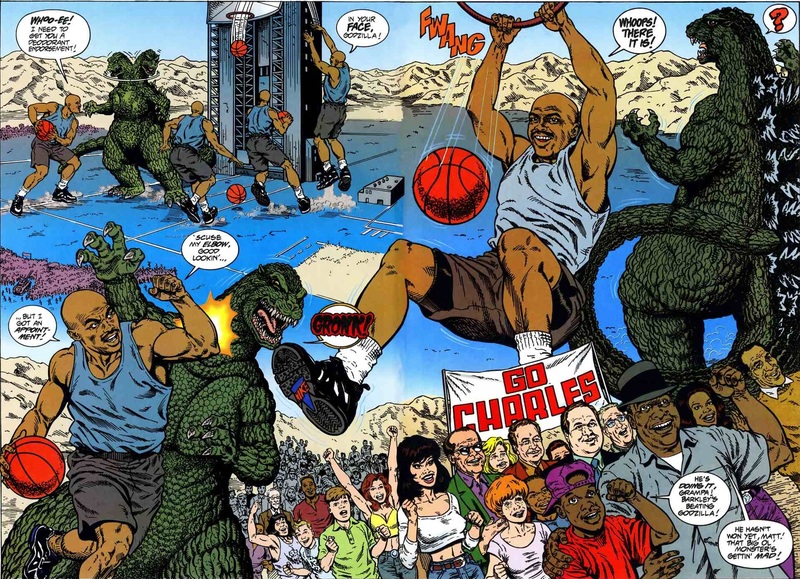 I suppose if Michael Jordan could be in a movie with the Looney Toons, why not DC comics and Looney Toons? They are both Warner Bros. property. It actually seems kind of fun too. I would want to browse through it just for the hell of it. Heres an amusing page for your curiousity. It’s not like they are actually battling either. They’re playing basketball. 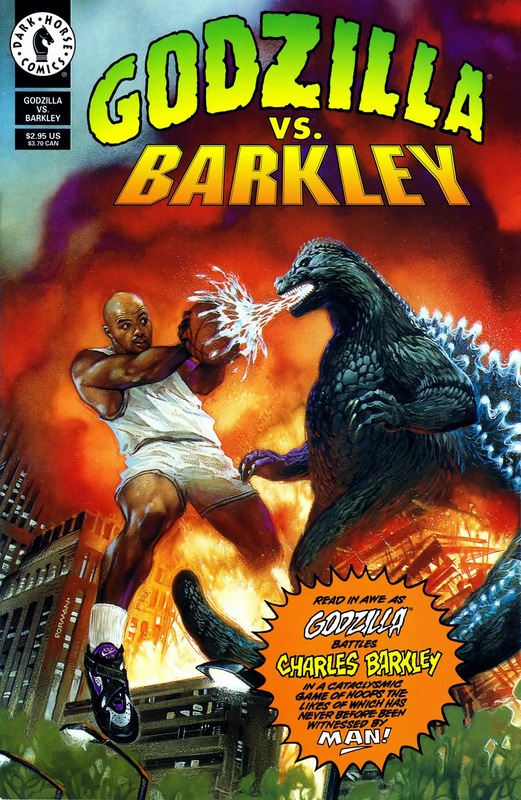 I guess Godzilla is a formidable B ball opponent. I’m actually curious as to how this story came to be. I mean, look at these pages! There you have it. 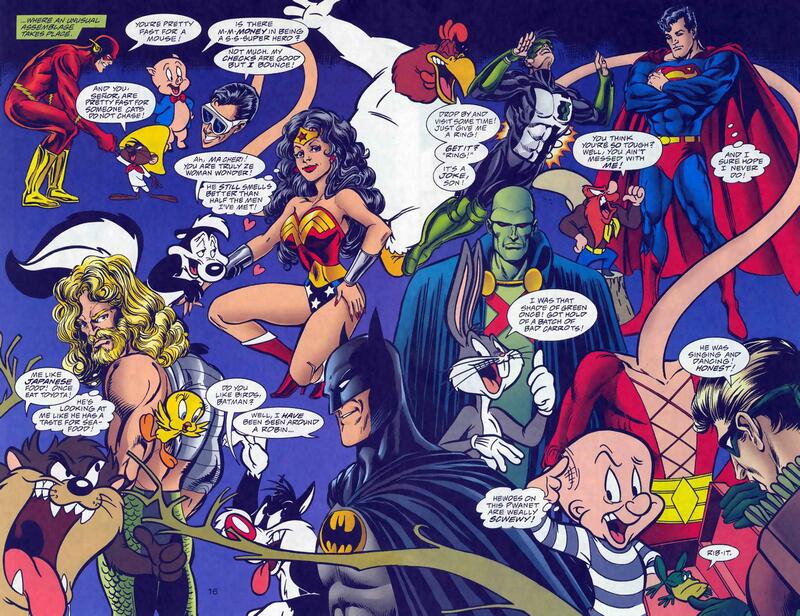 Just a taste of the weird and amusing world of the weird comic book crossover. Don’t expect to se as many strange ones these days but be sure, they still come out. This year alone they released Batman & Teenage Mutant Ninja Turtles, The Shadow & Twilight Zone and last years Django/Zorro. I was a fan, I’ll admit but what a weird crossover!